The continental distributions of freshwater fishes in the knifefish, family Notopteridae (Osteoglossomorpha), across Africa, India, and Southeast Asia constitute a long standing and enigmatic problem of freshwater biogeography. The migrational pathway of the Asian notopterids has been discussed in light of two competing schemes: the first posits recent transcontinental dispersal while the second relies on distributions being shaped by ancient vicariance associated with plate-tectonic events. We determined complete mitochondrial DNA sequences from 10 osteoglossomorph fishes to estimate phylogenetic relationships using partitioned Bayesian and maximum likelihood methods and divergence dates of the family Notopteridae with a partitioned Bayesian approach. We used six species representing the major lineages of the Notopteridae and seven species from the remaining osteoglossomorph families. 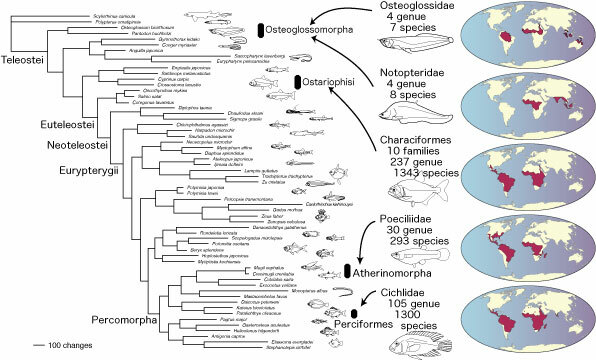 Fourteen more-derived teleosts, nine basal actinopterygians, two coelacanths, and one shark were used as outgroups. Phylogenetic analyses indicated that the African and Asian notopterids formed a sister group to each other and that these notopterids were a sister to a clade comprising two African families (Mormyridae and Gymnarchidae). 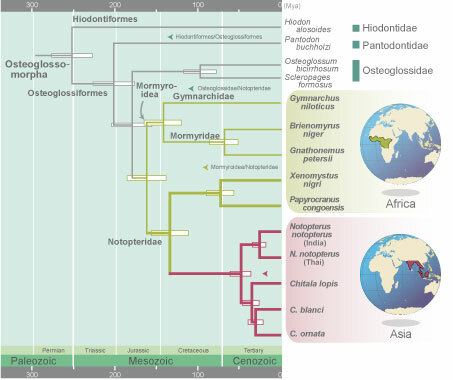 The phylogenetic relationships, in which the Asian notopterids were nested within African taxa (notopterids, gymnarchids, and mormyrids), favored the African origin of the Notopteridae and potential migration from Africa to Asia rather than from Asia to Africa. Estimated divergence time between the African and Asian notopterids dated back to the early Cretaceous (133 Mya) when India-Madagascar separated from the African part of Gondwanaland. Then, three alternative models are candidates to explain the historical biogeography of the Asian notopterids. (A) Estimated time of divergence based on the molecular evidence is at odds with the recent dispersal model. (B) It can be reconciled with the geological and paleontological evidence to support the vicariance model, "Out of India" hypothesis, in which the Asian notopterids diverged from the African notopterids in Gondwanaland and migrated into Eurasia on the Indian subcontinent from the Cretaceous to the Tertiary. India-Madagascar began to drift away during the middle to late Jurassic and completely separated from Gondwanaland (parts corresponding to the present Antarctica) 120-130 Mya and drifted northward. (C) We could not exclude an alternative explanation that the African and Asian notopterids diverged in Pangea before its complete separation into Laurasia and Gondwanaland, to which these two lineages were later confined, respectively. The supercontinent Pangea was split into Laurasia and Gondwana in the middle Jurassic (157-178 Mya). However, if model C were the case, it might be reasonable to expect the occurrence of notopterid fossils from regions connecting the two supercontinents. To the best of our knowledge, no such fossils are known. Several primary freshwater fish groups show an African-Asian (Bagridae, Schilbeidae, Clariidae, Aplocheilidae, Mastacembelidae, Anabantidae, and Channidae) or Gondwanan (Osteoglossidae, Cichlidae, and Aplocheilidae) distributions. The generality of the proposed hypothesis will require additional testing with other groups showing such disjunct distribution patterns. Recent technical developments in DNA sequencing and molecular dating have enabled examination of biogeographic hypotheses based on more realistic 'relaxed clock' assumptions of molecular evolution. The "out of India "hypothesis holds that some Asian biotic elements have an ancient Gondwanan origin and arrived in Asia by rafting on the Indian plate. Recent molecular phylogenetic and dating analyses also suggested an "out-of-India" migration in ranid frogs, ratite birds, arowanas, channids, and cichlids.